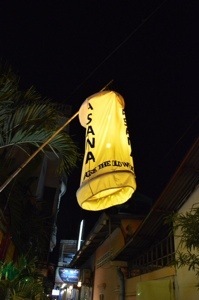 Siem Reap is filled with countless bars on and off Pub Street but I have to say the Asana Bar is by far my favourite in the whole town. Originally this beautiful building was a home and one of the last traditional houses left in Siem Reap. The owners not wanting to demolish it turn the house into a bar. There is ample seating throughout the bar and underneath the house is hammocks and floating beds (where four people can sit comfortably). 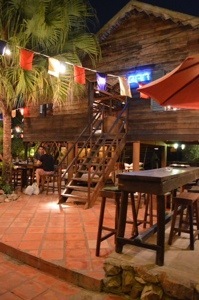 It has a laid back relaxed vibe and although the beers are not the cheapest in Siem Reap they are reasonably priced at around $2USD. 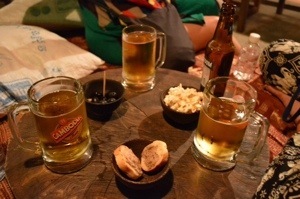 There is a great nibbles menu to select from as well. Best description I’ve heard about finding it is to stand on Pub Street facing the Temple Bar (you can’t miss it) and just to the left you will see an alleyway. Head straight down the alley way and you can’t miss the beautiful house on the right.